The US State Department has described Saturday's knife attack which killed 29 people in China's Kunming city as "an act of terrorism". The statement comes after Chinese state-run media accused Washington of double standards for its initial reluctance to use the phrase. They also accused Western media of bias for not using the word "terrorist". 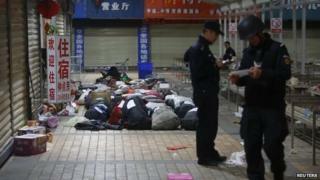 Officials have blamed separatists from Xinjiang - which is home to the Muslim Uighur minority - for the attack. Eight attackers stabbed people at random in the south-western city's railway station. More than 130 people were also wounded during the attack and 20 remain in a critical condition, Chinese state media say. Officials say that four attackers were shot dead by police at the scene and an injured female suspect was also reportedly detained. The three remaining suspects were arrested yesterday, state media said. Beijing has long complained about what it sees as double standards being applied to its problems in Xinjiang. It sees the foreign news coverage of the events in Kunming this weekend as further proof. In some ways this is no different from the sensitivities sometimes on display elsewhere in the world. Media attempts to understand the motives for the 9/11 attacks were seen by some in America as dangerously close to sympathy. There are, as is often the case, signs of heavy political management of the Chinese media's own coverage of the attack. Online comment has been censored and many newspapers have carried the same centrally prepared Xinhua articles. The use of the word "terrorism" is there of course but there's little discussion of why it might have been carried out. China is not the first to complain about the failure of the international media to use the label. The BBC was criticised for not using the word following the gun attack in a Nairobi shopping mall last year that left 72 people dead. The corporation's editorial guidelines say that journalists should avoid using the word "terrorist" without attribution. The use of the word, the guidelines suggest, often involves a value judgement. In an initial reaction, the US Embassy in Beijing described the attack as "a horrific, senseless act of violence". This provoked anger in state media, with state-run news agency Xinhua saying this revealed "double standards in the global fight against terrorism". "Behind its wording is the entrenched US belief that the Xinjiang murderers were the 'ethnically oppressed seeking autonomy'," it said. On Monday, US State Department spokeswoman Jen Psaki said the violence in Kunming "appears to be an act of terrorism targeting random members of the public". A People's Daily editorial on Monday also criticised Western media for its bias in describing the attack. "Aren't you talking about 'human rights'? Have you seen those victims lying in a pool of blood?" it asked. "If the same thing happens in the US, no matter what the casualty is, how will you comment on it, and are you still going to be stingy about using the term 'terrorist'?" Both this attack and an incident late last year in which a car ploughed into pedestrians in Beijing's Tiananmen Square have been attributed to separatists from the far-western region of Xinjiang. Xinjiang, which borders Central Asia, is home to the Uighurs - a Muslim minority group who in recent years have lived increasingly uneasily with rising numbers of Han Chinese migrants. In 2009, ethnic rioting in the region's capital, Urumqi, left more than 200 people dead. There are sporadic violent attacks, such as an incident in January in Aksu which left 12 people dead - six were shot by police and six died after setting off explosives, state media said. Authorities traditionally blame extremists for these outbreaks of violence, while Uighur activists point to tight Chinese control as a cause of tensions. Establishing facts independently is difficult, because foreign journalists' access to the region is restricted. In a statement, the World Uyghur Congress - a Germany-based umbrella organisation of Uighur groups - condemned the violence "unequivocally", but also called on Chinese authorities to be open and transparent in their investigation. It urged Beijing "to refrain from using this as a pretext to further and indiscriminately crack down on Uighurs as precedents suggest, and to show a measured response". "It is absolutely vital the Chinese government deal with the longstanding and deteriorating human rights issues facing Uighurs if tensions are to be reduced," its president, Rebiya Kadeer, said in the statement.